I hate watermelon and I hate kiwi. 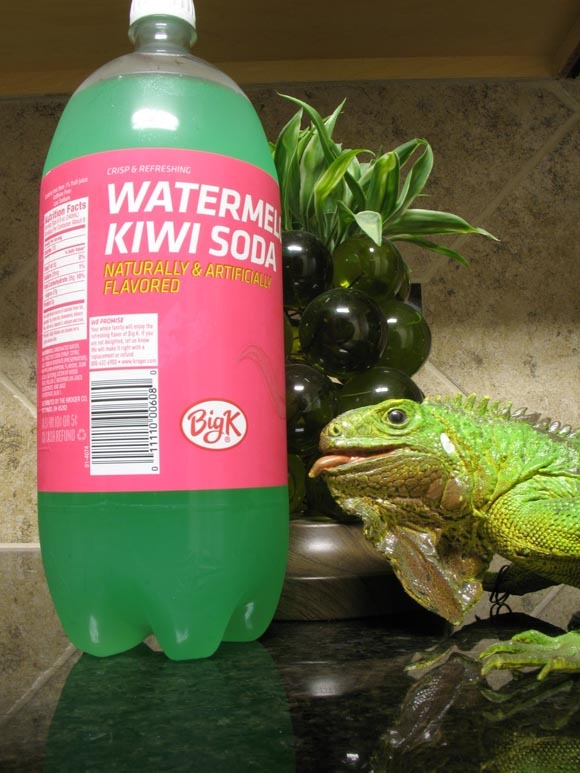 So why am I drinking this anti-freeze colored liquid with the name of Big K Watermelon Kiwi? One Mr. Dan Dub has kindly brought this delightful combination of flavors to my attention… in two full liters mind you! Seeing as I will drink any soda anyone brings me here goes. Here I go down this misguided path. It’s like walking down a well-lit alley, looking at the mugger at the end as you flip your wallet from hand to hand. Maybe drinking this out of an Atari pint glass will help with my soon to be sadness. Awwww… my Centipede glass is dirty so I have to go with Tempest. Ah well… time for a whiff. Yup. That’s definitely the smell of chemicals made to smell like watermelon/kiwi. I really don’t want to smell this again just to write another sentence about it so we’re going to move on.